On the last Saturday in February, for a change I was not looking forward to going to the barn. Sascha’s criticisms of the week before were affecting my confidence level. I decided to go out there and take it one step at a time. 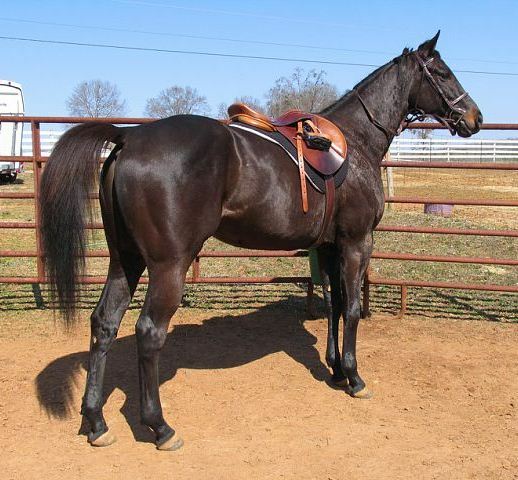 I wanted to work with him on clipping because I knew he needed some work in that area (he had flipped out when Logan needed to clip the hair around his puncture wound), and his bridle path was getting a little out of control. 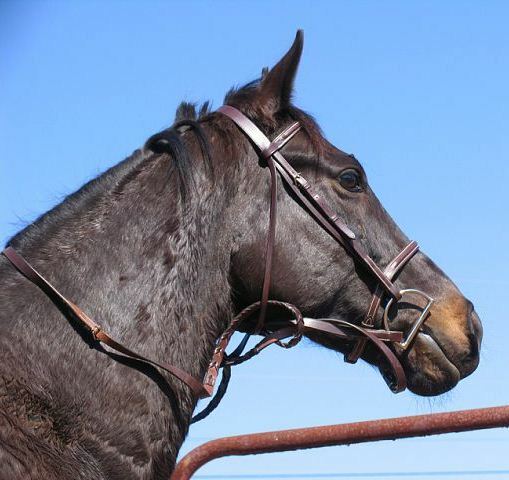 At first I put him in the crossties, but when I started the clippers and began the process of desensitizing him to them, he showed the desire to run backwards. I didn’t want him hitting the end of the crossties and panicking, so I put him on a lead rope instead in order to be able to move with him. Jane was finishing up with J.R., and she was nice enough to help me a bit by plying him with carrots in order to get him to lower his head. 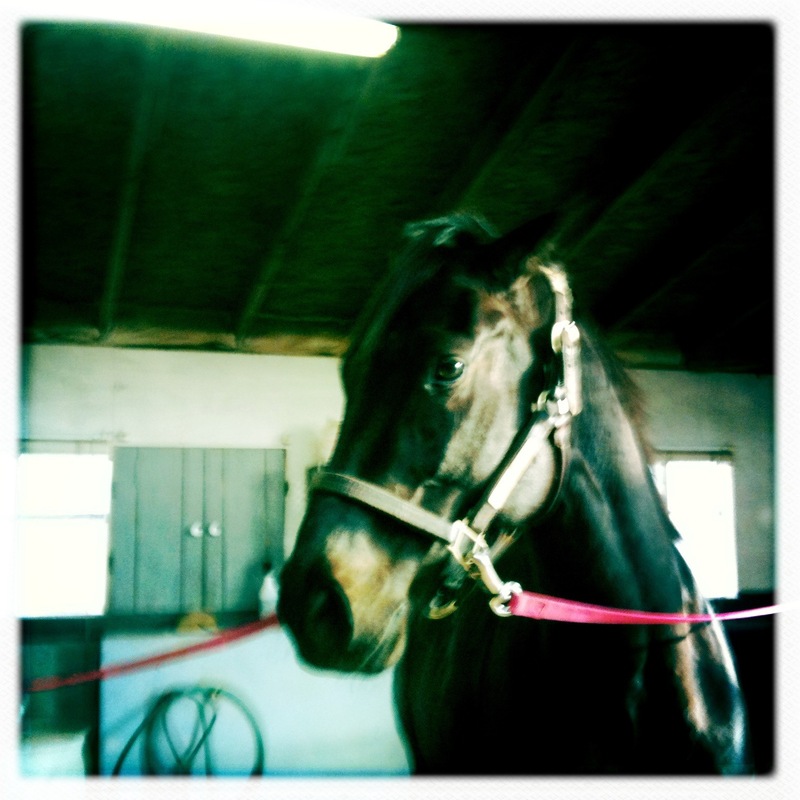 He was fine with me rubbing the clippers on him, including on his face, but he got nervous when I went higher (near his ears and bridle path). 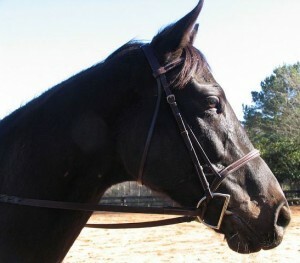 We kept the session very low-key, and I got about half of his bridle path trimmed. His strongest reaction seemed to be to the different noise that the clippers make when they cut through hair. 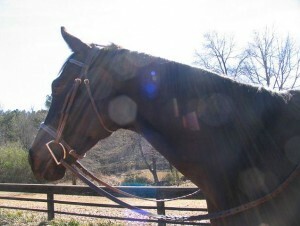 I tacked him up and took him outside to lunge him. I put him in Indy’s flexi mullen mouth D-ring. Indy had liked the bit, and I thought it might help with Vindy’s tendency to put his tongue over the bit. I also put on my Tom Thumb spurs, which are one of the mildest kinds of spurs. I thought this might help me keep him at a trot as Sandi had suggested without a ton of kicking. I was going to lunge him in the round pen, but they were burning some brush in a pile near the round pen, and when we started to walk out there, he had a pretty strong reaction to the smell of the smoke and the popping of the branches. So I decided to lunge him in the arena instead. 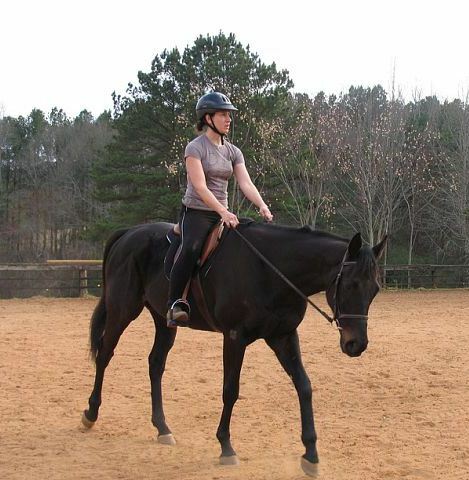 The lunging went just fine (much better than the Monday before), so I felt confident getting on him. He doesn't look like a horse who's about to flip out, does he? He’s still being bad off and on about not standing still at the mounting block, so we worked on that a bit. 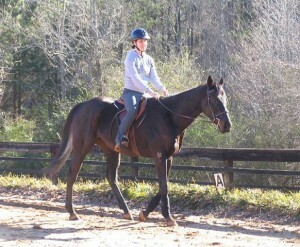 I got on and walked him a bit, then began work at the trot. He was getting a bit too forward, so as recommended I decided to use circles to regulate his pace. I directed him into a circle going to the left, and all of a sudden he exploded and went bucking across the arena towards the gate. I used my right rein and leg to pull him into a one-rein stop while concentrating on keeping my heels down and sitting back in a secure position rather than falling into a fear crouch. 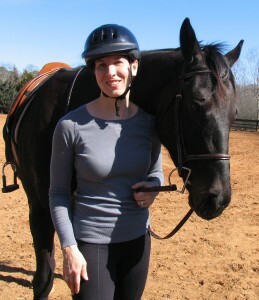 Thankfully my new full seat riding tights kept me glued to the saddle, and I stayed on. I got him to a stop at the gate. I was determined that he was not going to get away with this kind of behavior, so I sent him forward again, but he was completely riled up. 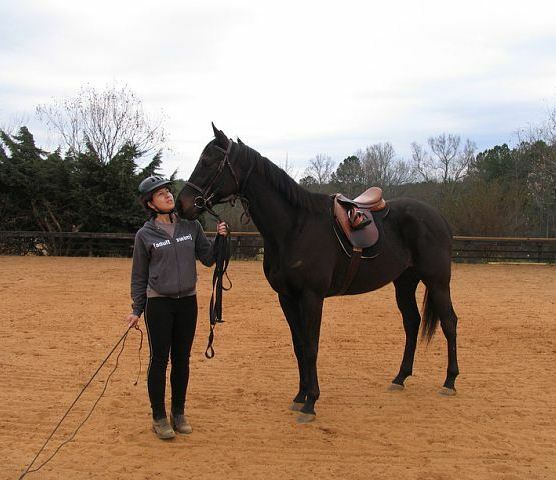 I kept having to use the one-rein stop to keep him from bucking. Finally I decided that it would be safer to work him on the ground. It was only when I got off that I realized my right spur had snapped into 3 pieces during the bucking incident. 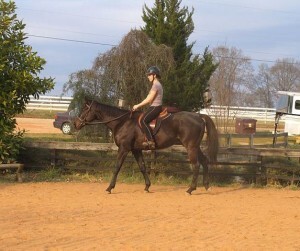 I put him back on the lunge line and took him to the far side of the arena. I sent him into a trot, but again he exploded and started plunging away from me. I should have let go of the lunge line immediately, but I tried to stay with him until he pulled me off my feet and started to drag me. I had rope burn on my left hand because I foolishly wasn’t wearing gloves. But besides that, I was unharmed. I watched him gallop around the arena with the lunge line trailing after him. I just prayed that he didn’t step on it and hurt himself. Kensley had run to get Lorie, so she came out to the arena. She asked if I wanted to just let him get it out of his system, and I said yes, so we let him gallop around until he decided on his own that he had had enough. 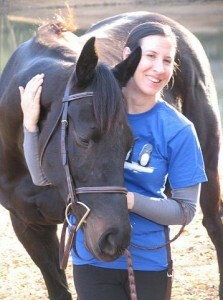 Lorie suggested taking him to the round pen and free lunging him there. She doesn’t like working horses in the round pen with a saddle on, so we took his saddle off and left it on the arena fence. Once in the round pen, she showed me her technique for working horses in his state–having him change directions a lot and stay in one direction until asked to change. 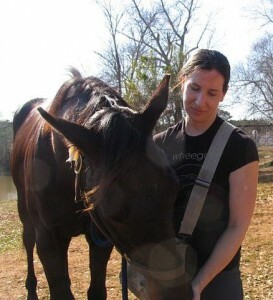 She also discussed the difference between the horse turning towards you to change directions or turning away from you. After she demonstrated for a few minutes, she left me alone to continue. 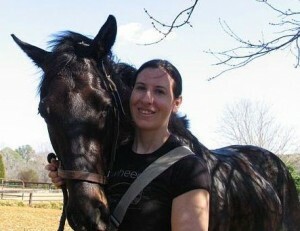 I worked him at the trot, changing directions frequently, until he was quite sweaty and washy between his hind legs. He gave me a nice whoa, and I decided the lesson was over. I took him back to the arena to hotwalk him. Once I felt he was cool enough, I took him to the wash rack to hose the sweat off him, then put him in his stall for his dinner. It had been a stressful session. I was covered in dirt from the arena, and my finger was hurting from the rope burn. But I was proud of myself for staying on and felt that we had ended on a positive note. I’m still not sure what set him off. Was it the rigidity of the mullen mouth bit? The burning brush pile? The application of the spurs? Seeing how far he could push his desire to get out of work? A combination of these things? I don’t know and probably never will, but I decided it would be in Vindy’s best interest to be worked more days a week. 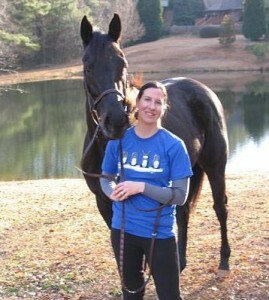 I asked Lorie is she would be available to lunge him twice a week. She said yes, so I have paid her to lunge him twice a week for the month of March. We’ll see how this improves his discipline, work ethic, and obedience. Sascha was able to go out to the barn with me on Monday. It was her first time meeting Vindy. 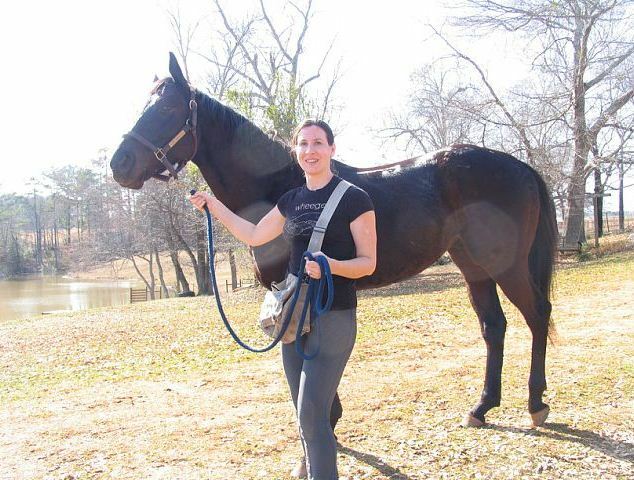 We walked out to the pasture to get him, and on the walk back to the barn he was pulling the prancey hijinks he pulls every once in a while; I guess it’s when he remembers he’s a former racehorse. I groomed and tacked him. 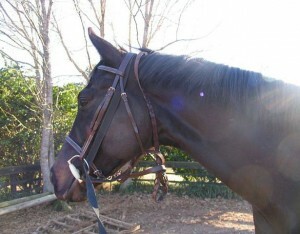 Mary Jo had left a copper roller D-ring for me to try, so I put that bit on my bridle. 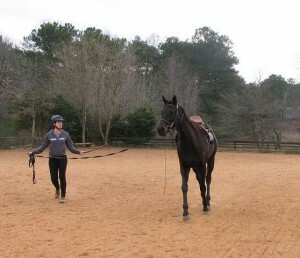 I lunged him first, and he was unfortunately back to some of his old tricks. Lauren was hand-walking Rose in the arena at the same time to give her some exercise, but I don’t think that should have been enough to distract him. Sascha was critical of my technique, saying that my timing was all off. She also said that I should have him on a larger circle. 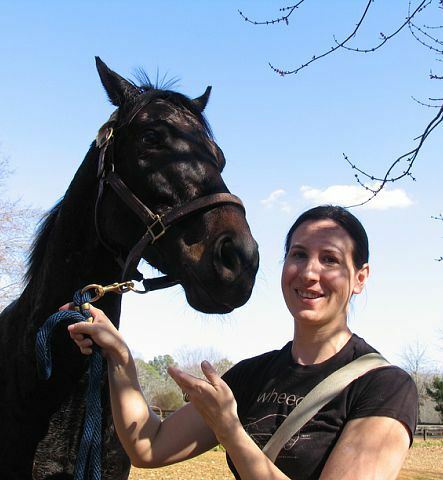 I explained that Beyond the Track suggests a smaller circle when the horse tends to turn towards you. She countered that you can’t learn to train a horse from a book. This criticism probably caused me to become even more flustered. She suggested that I might want to ask Sandi to give me a lunging lesson. 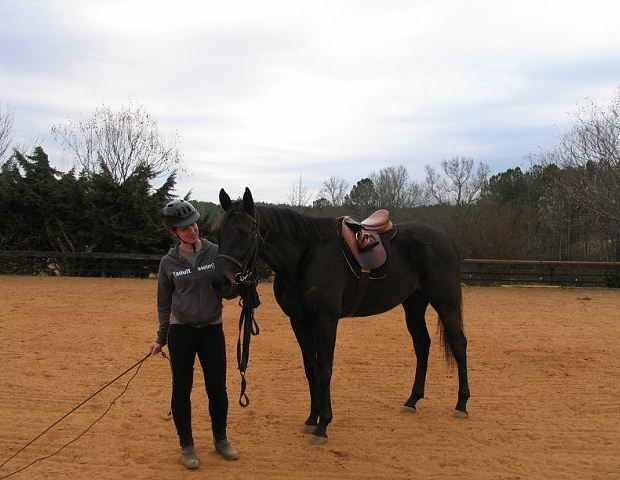 Because the lunging was not going well, I finally decided to just get on him. I practiced the method that Tinsley had been using the day before, and I felt like it was starting to sink in with him. However, Sascha was again critical of my results. She said that he is going where he wants to go and that I am just a passenger. She said I would probably want to talk to Sandi about it when she arrived. I didn’t want to infringe on the lesson that Sandi was giving, but I did chat with her briefly when she first got there. She said that we looked good. I explained some of my problems with him stopping and not wanting to go, and the technique we were trying to get past it, and she said some horses get bored working at the walk and that I might want to do as much trot work as possible. She also noted that he is putting his tongue over the bit, and I told her that he has been doing that pretty often. She suggested that I raise the bit up, but noted that since I was out of holes, I would need to punch some new ones in the bridle. 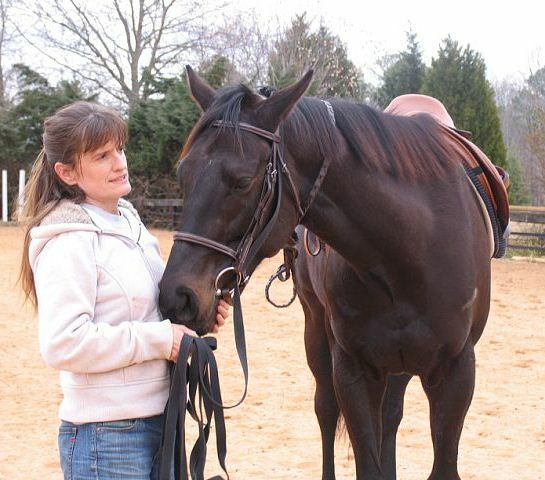 I asked if she would be available to give me a lunging lesson sometime, and she said she would love to work with me and that I should email her to work something out. Hopefully we will be able to do that if I can leave work early on a Monday. 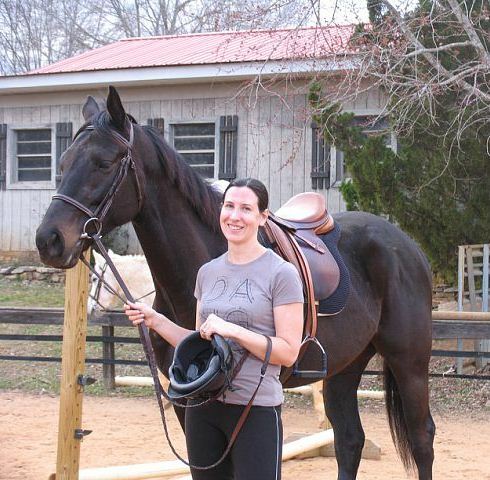 Since Sandi was getting ready to start a lesson, we finished up and took Vindy back to the barn. I don’t like working him when there are children in the ring since I feel like he can still act like a rambunctious colt sometimes. Sascha did say she was impressed with how calmly he stood in the crossties when the horses were let up to the barn for feeding time. I had forgotten my camera, so I only had my iPhone to take pictures. After we finished up with Vindy and had him settled in for his dinner, we went to Sascha’s place to feed her boys. I was very thirsty, so we stopped at a convenience store on the way, where Sascha chastened me for getting a Coke ;-). Sascha’s boys, Rocky and EZ, are both looking very well. We cleaned the stalls, picked out the paddock, and fed them their dinner. It was getting dark by the time we finished, and I had to go home to accompany Jhays to the hardware store, so we headed back to civilization. I’m glad we were able to spend the day together and that Sascha was finally able to meet Vindy. Tinsley was able to accompany me to the barn on Sunday. We stopped at Horsetown on the way out there so I could pick up Vindy’s Likit treats for his stall toy. 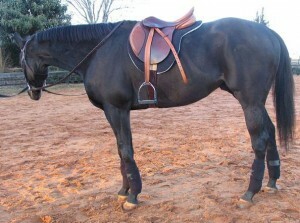 I also bought some side reins and a couple more pairs of riding tights. 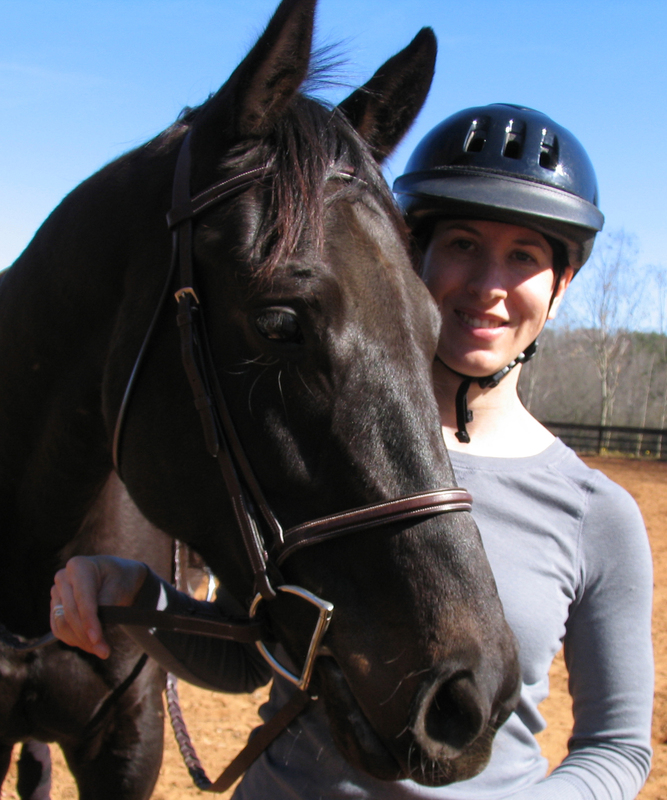 We wanted to try a bit with a roller, so Lorie let us borrow one of her loose ring snaffles that has a roller. After grooming him, I planned to work him in the round pen, but they were in the process of moving it, so several of the panels weren’t up. 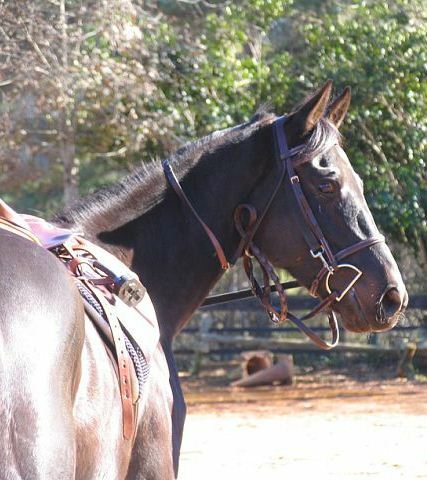 We tried fitting him with the side reins, but they weren’t long enough to allow him to carry his nose in front of the vertical, and we need to start off slowly. So I lunged him without the side reins. 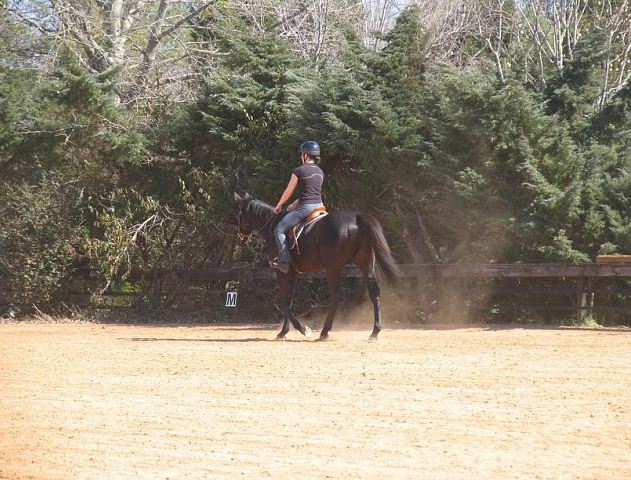 He did well during the lunge line work. Next I got on to ride. 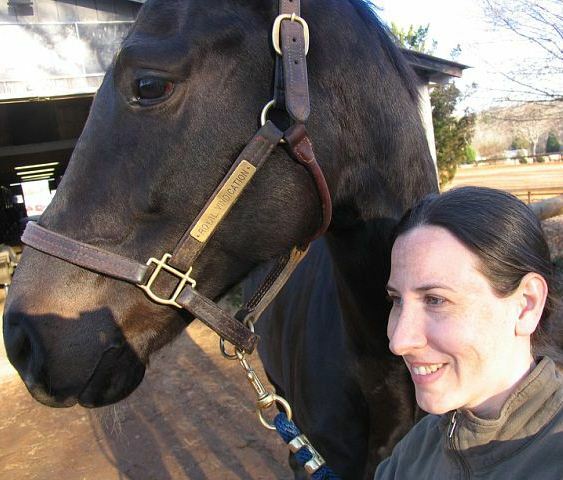 I demonstrated the one-rein stop to Tinsley a few times so she could see how I was asking for it and how he responds. We were seeing problems with his laziness and with his tendency to balk at certain points in the arena, namely near the gate and near the bushes that come into the arena. The bit was also causing some problems because it was pulling through his mouth when he tried to evade it. 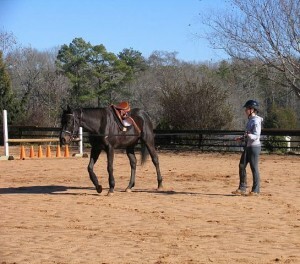 Tinsley put me on the lunge line for a while so that we could work together on keeping him moving. Tinsley had been talking to Paula about using your leg to disengage the hindquarters if the horse is refusing to move from a standstill and then getting the horse to walk on once he starts to shift his feet. The first step is to get the horse to give to the one rein and to reward any softness the horse gives you. 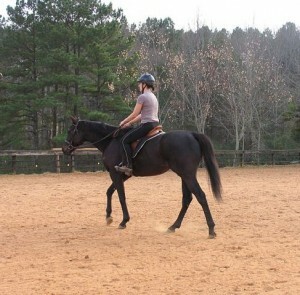 The next step is to use your leg to shift the hindquarters over. I got off and Tinsley got on to show me what Paula had described. This also allowed me to confirm that he was indeed crossing one hind foot over the other, which is the proper way to do this turn on the forehand. He demonstrated some resistance at first, but she kept at it, and he finally walked on from the turn. She rewarded him, and we ended on this positive note. Tinsley was also nice enough to take some posed pictures of us, and I took a few of her too. All in all, it was another successful day. It’s incredibly helpful to have a person with you to tell you what they see from the ground and to bounce ideas off of. I always feel like I accomplish more when Tinsley is able to join me. I was excited about this weekend because (a) it is a holiday weekend and thus will allow me to work Vindy three days in a row, and (b) the forecast was for unseasonably gorgeous weather. Saturday turned out to be warm and beautiful as promised. 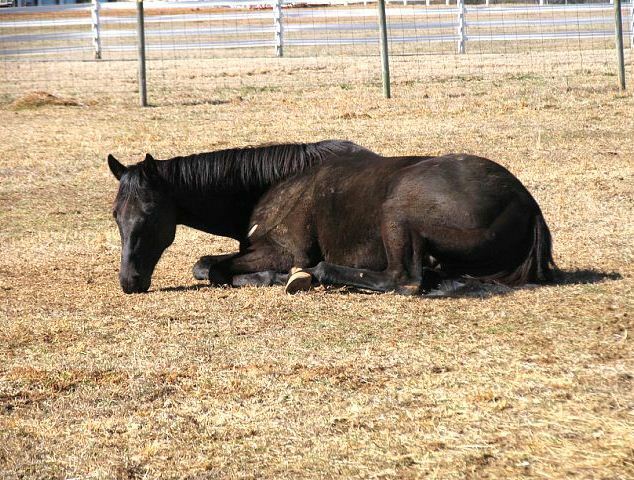 When I pulled into the driveway of the barn, Vindy was stretched out flat in the pasture, taking a nap in the sun. 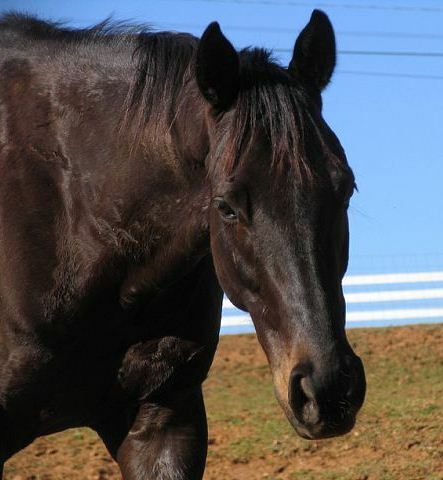 When I walked out to get him, he was up on his feet, and he came trotting up to me. He was sweaty and dirty, so I warned him that a bath was in his near future. 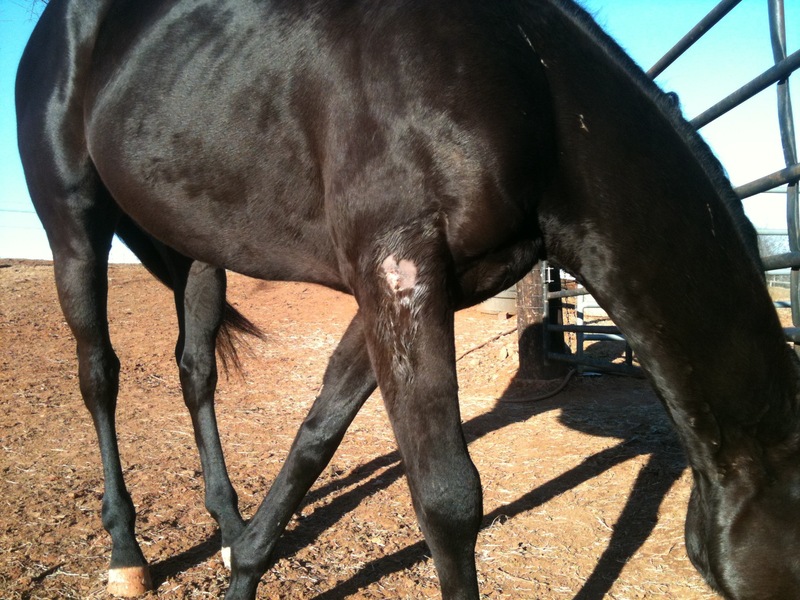 I groomed and tacked him as usual, noting that he had a bit of swelling above his inside left knee. I asked Lorie about it, and she checked it out and said he was not showing signs of soreness, so light work might be good for it. 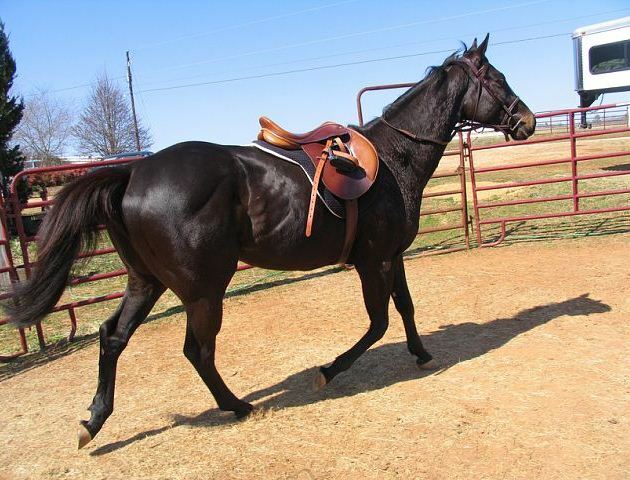 I took him out to the round pen for some free lunging. He worked obediently at the walk and the trot. 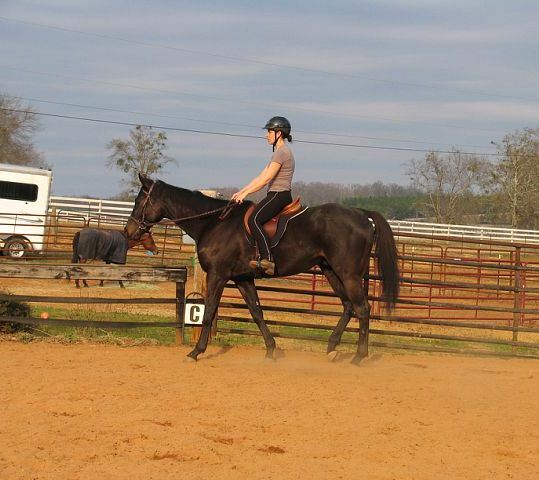 I continue to be pleased with how his lunge work is progressing. I think a lot of it is less about him than about me being more confident and assertive with my body language. 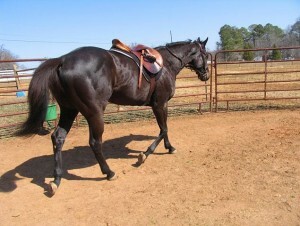 Regardless, he is doing well with maintaining forward movement while lunging at the walk and trot. I would now really like to add some side reins to work on his suppleness and frame. 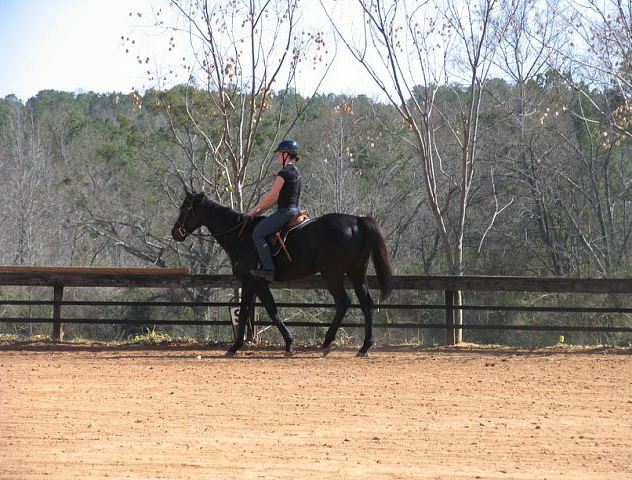 After the work on the lunge line, I took him out to the arena for under saddle work. Mary Jo was riding Roisin at the same time, so I apologized to her in advance for any hijinks he might pull. Some workmen were digging up the area by the fish pond at the entrance to the barn, so Vindy was paying a lot of attention to the growing mound of dirt and to the machinery. He wasn’t spooking at it, but he was taking a hard look. My main goal for the day was to work on the one-rein stop. We practiced it multiple time around the arena, going both directions, and he caught on quickly. The key was definitely in using my leg to disengage his hindquarters. I was very happy with how he was doing on that. Unfortunately, he still showed the tendency to want to stop at certain points around the arena, namely at the gate and near where the men were working. So I was working on keeping him moving, and Mary Jo helped out by letting us follow Roisin for a while. Mary Jo and I were standing near the gate at one point talking to Lorie, when one of the dogs started rustling around in the bushes. The next thing I knew, Vindy was taking off across the ring, doing what Lorie termed a very rapid shoulder out. 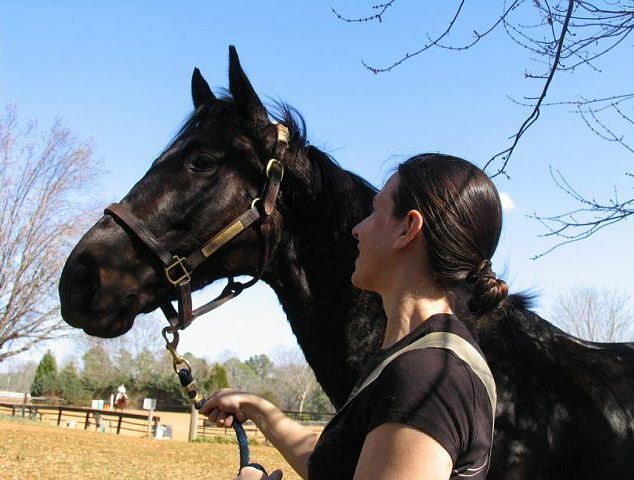 I focused on pulling my right rein to my hip and applying my right leg, and eventually he came to a stop. My heart was pounding, and I had to take a minute to regain my composure. It was only at that point that I realized Roisin had also spooked, and according to Mary Jo, had teleported to the middle of the arena. 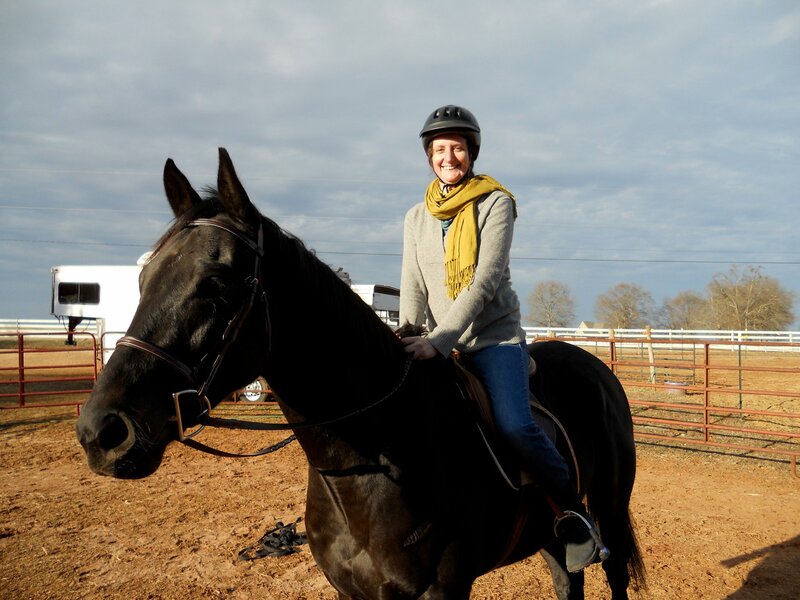 I felt better knowing that Roisin had spooked too, and Mary Jo and I agreed we should be proud of ourselves for staying on during their little rodeo. Mary Jo didn’t want to end on that note, so she cantered Roisin around a bit while Vindy and I stood in the middle of the arena. Then I walked Vindy around a bit more before getting off. 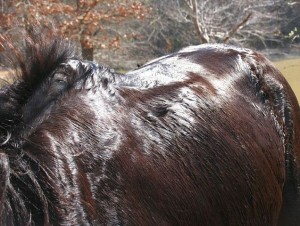 After our ride, I gave him a bath. It was nice to wash away all the dirt he had accumulated over the winter. 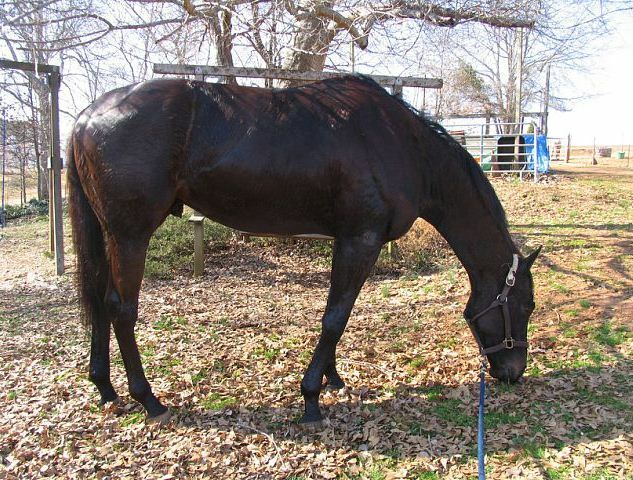 He was a perfect gentleman for bath time, which was to be expected since racehorses are bathed so often. 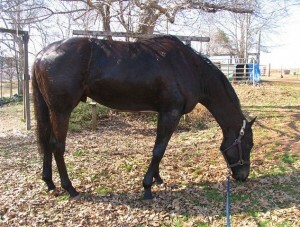 I wanted to wait until he was dry before I turned him out, so I took him out to graze in the backyard. I also made him pose for some pictures with the auto timer. He was not so cooperative for this part. 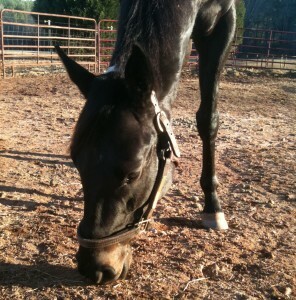 After he was fairly dry, I took him back out to the pasture and turned him out. Regal and Ted were waiting for him and accompanied him out to the round bale. I had book club on Saturday, so I didn’t make it back to the barn until Sunday. When I went out to the pasture to get Vindy, he was lying down having a snooze. He didn’t get up even when I walked up to him and started petting his forehead. He didn’t bother moving until Sam came too close to comfort, then he got up and happily ate his peppermint while I put his halter on. "You want me to get up? Really?" I took him into the wash rack for a good grooming; he was quite dirty. 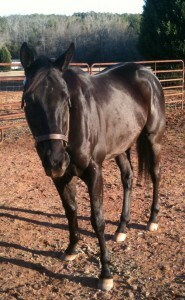 I cleaned him and tacked him up, then wrapped his legs. He was a good boy for all of this. 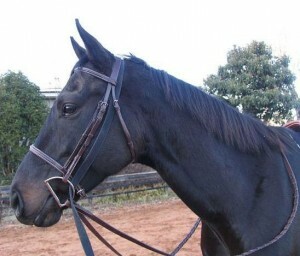 I then took him out to the arena. 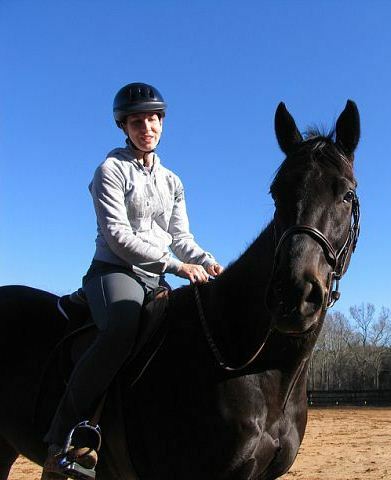 Cindy was riding Regal at the same time. 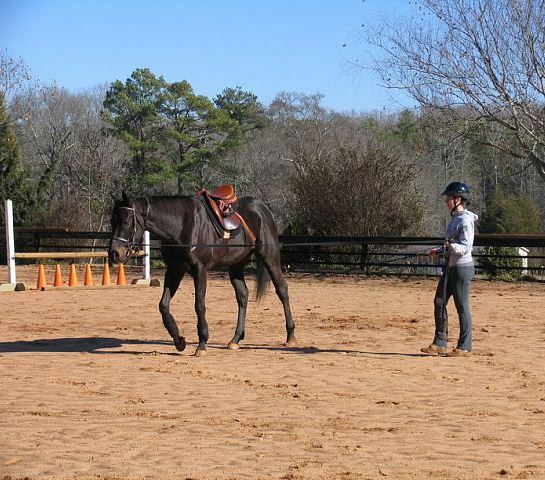 We started with lunging, as is our usual routine. He did very well going to the left. I kept him on a small circle and kept him to a walk, and he did much better staying on the circle. When he came in towards me, I was able to quickly correct him and get him back where he was supposed to be. He halted at my voice command. Then we switched to go to the right. As usual, he had more trouble in this direction, although it was still better than some of his prior efforts. 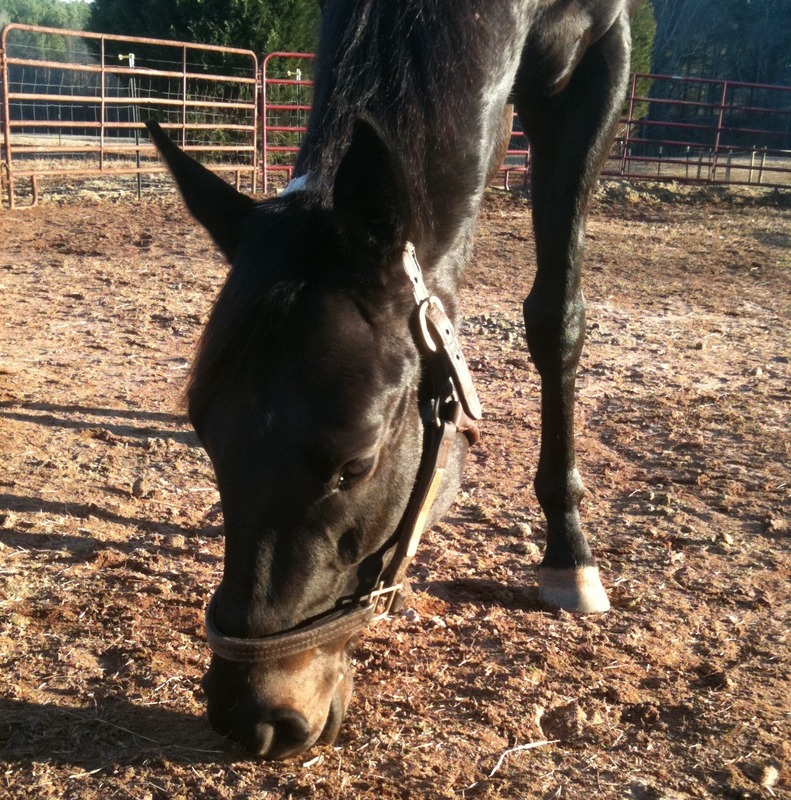 The biggest problem was when he decided it would be fun to grab the lunge line and go around with it in his teeth. I spent some time repeatedly telling him that he was a bad monkey and that this was not what I had in mind. We’ll have to see if this is his new favorite game, in which case I’ll have to figure out how to discourage it. He did give me another good halt in this direction though. 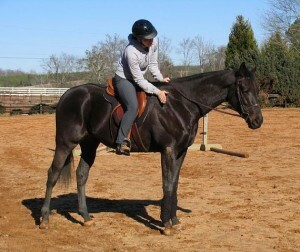 I took him to the mounting block and got on. He didn’t move away at all like he had done last time. We walked around the arena, and he did very well. He was quiet, and although he still shows an inclination to stop at certain points (the gates and near the bushes, which he wants to chew on), he was being fairly obedient. 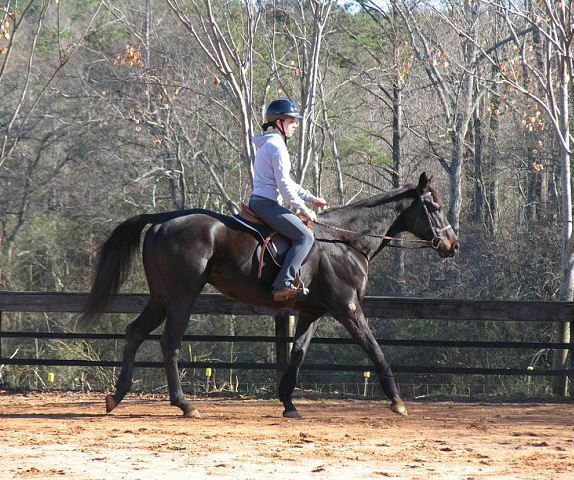 I decided it was a good time to try some trot work. It took a good deal of clucking and leg to get him going, but I did get some steady trotting out of him. When he would fall back to the walk before I asked, I would work to get him going again. 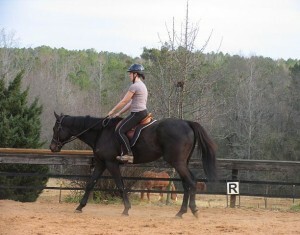 As mentioned, it took a good bit of leg to keep him going at first, and I am still not legged up. This is one of the reasons I’ll be glad when it stays light later so I can ride more days a week and get back in shape. Then he got a little frisky, and he seemed to want to do more, but I wanted him to stay at a trot. He trotted up fast behind Regal and tried to bite him on the haunches before I could get him stopped. Then he was working at a very fast trot, so Lorie suggested I use a lot of circles to make him more supple and to moderate his pace. I was working on these circles when he suddenly started evading the bit and crabwalked across the arena to go after Regal. He basically t-boned Regal, who was incredibly patient with an idiot youngster jumping on him. He stayed calm, and Cindy kept her head too, which kept the situation from getting more out of control than my rambunctious juvenile delinquent already was. 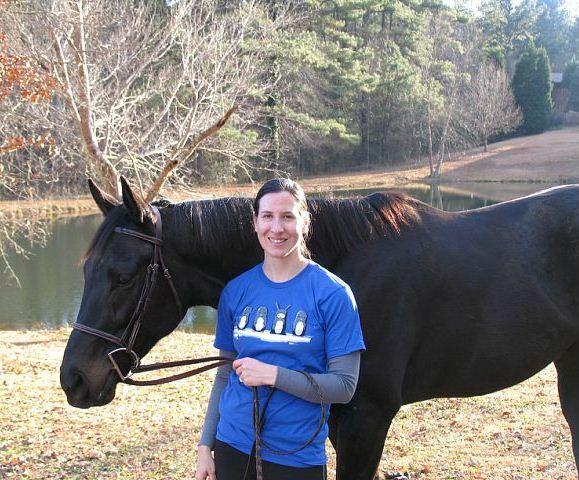 Lorie said she thought Vindy was taking advantage of the different dynamic of the riding ring to get some hits in on Regal, who is over him in the pasture pecking order. But as I was driving home and thinking over it, I wondered if he was instead treating Regal like a lead pony. 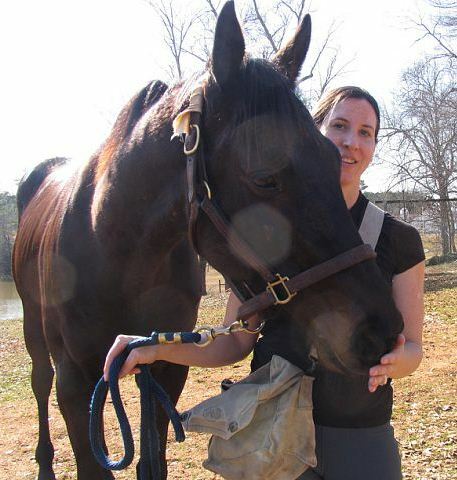 Racehorses often want to play rough with their lead ponies and use them as outlets for their excess energy, which is why lead ponies frequently wear leather guards on their shoulders to protect them from nervous nips. As a racehorse, Vindy would have been quite accustomed to having a pony lead him to the starting gate, and being in the arena with Regal might have reminded him of that practice. I’m curious to talk to Tinsley about this and see what she thinks. After his shenanigans with Regal, I kept him to a walk. We went around a few times, he gave me a nice halt on command, and then I got off. I took some head shots of him, then used the automatic timer on the camera to take a few of us together. 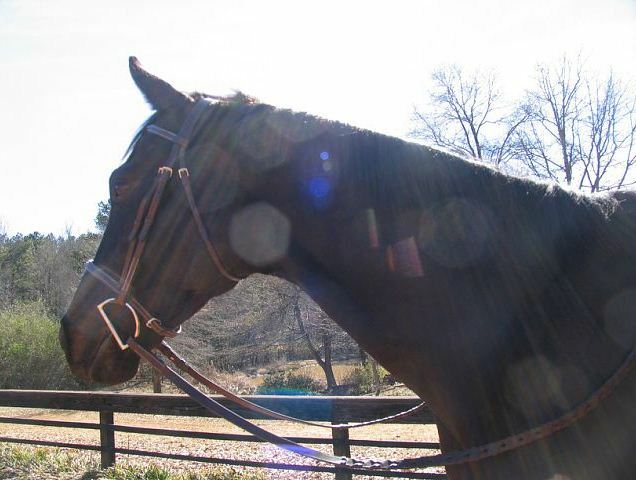 Then I took him back to the barn, untacked and groomed him, then led him out to the pasture to enjoy the rest of the afternoon sunshine. It’s clear we still have some behavior that needs work, but I feel like we move forward with almost every ride. I think once we are able to work together several days a week, we will make even faster progress. 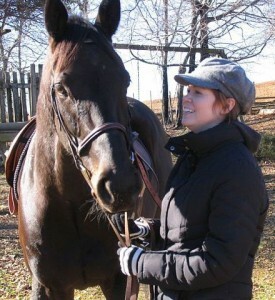 Brandy came out to the barn with me today to meet Vindy. The area by the gate was a mud pit, so my boots and Brandy’s sneakers ended up coated with it. Vindy had worked hard to get muddy and was thus coated with mud on his legs, neck, and face. Since he was wearing his blanket, his body was still clean at least. The puncture wound on his leg is doing a lot better, so I decided it would be OK to ride him as long as we took it easy. 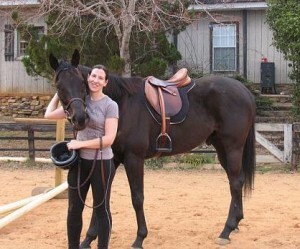 I cleaned him up as well as I could, then tacked him up. We took him out to the ring, and Brandy was gracious enough to take pictures while I worked him. 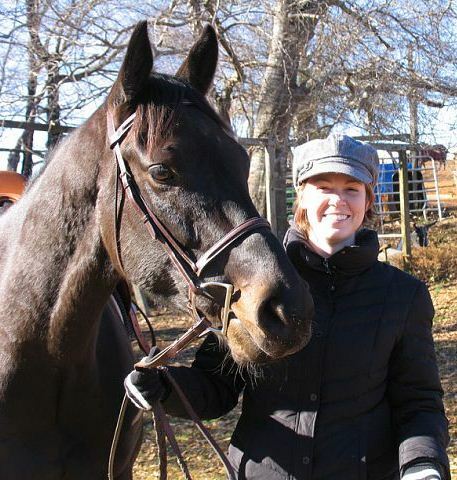 Kaye and Mary Jo were both riding as well, so this was the first time that I rode him while other horses were in the arena, and since Mary Jo was taking a jumping lesson, it was also the first time that he had been ridden while the jumps were set up in the arena. I started by lunging him just a little bit. We kept to a small circle at the walk, and he did fairly well. He is getting better about keeping moving forward and staying on some semblance of a circle around me. He still does better with free lunging, but I continue to be pleased with his progress on the lunge line. "But what's that over there?" With all the activity going on around him, he didn’t want to stand still at the mounting block, so we had to repeat the lesson a few times before he stood like a good boy. Once I was up and we started going around the ring, he was on his toes and prancing a bit. 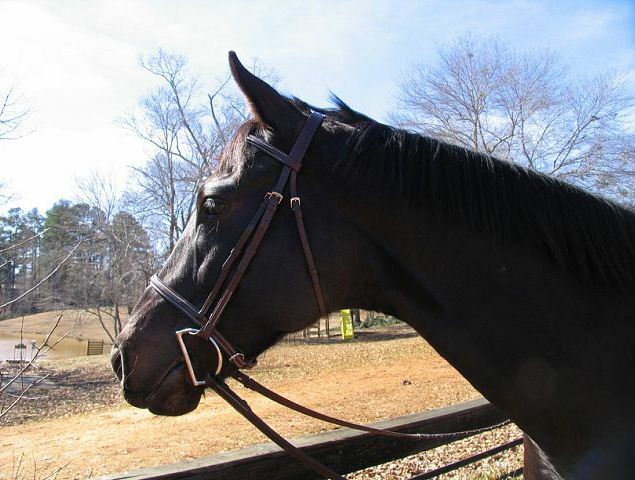 When he would break into a trot, I tried to use my seat and voice to quiet him down again. He tended to act up more when Mary Jo and Roisin would jump a line, which was to be expected. But for the most part, he kept to a walk like I asked. When I was happy with what we had accomplished for the day, including a lovely halt, we stopped so Brandy could take a few more pictures. 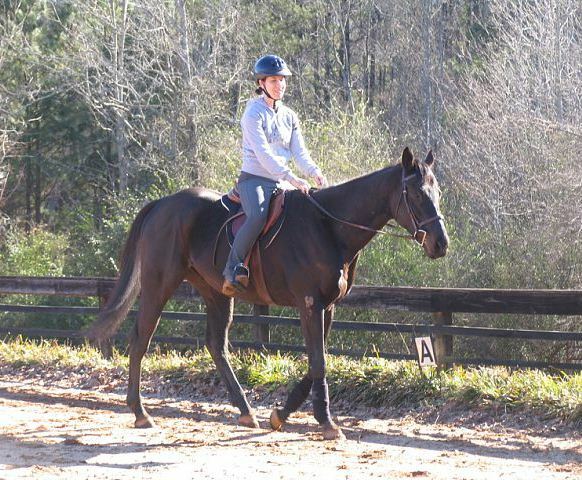 I think Brandy looks like a steeplechase trainer in these pictures. After our little photo session, we took him back to the barn for untacking and a final grooming. 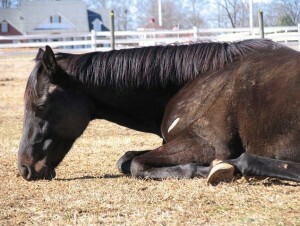 I brushed as much mud as I could off his blanket. I would like to take it home to wash it, but he will need it when the temperatures dip down this week. We then put his blanket back on and took him back out to the pasture. As we were leaving, I noticed one of the leg straps had come undone, so I parked the car and we went back out there to fix it. He followed us all the way back to the gate begging for more candy. Yes, I might have created a monster. Lorie texted me on Saturday morning to say that the abrasion on Vindy’s right forearm was tender and oozing pus, so I texted Logan to ask him to come out when he could. I needed to go to Horsetown to return the refills for the Likit that were the wrong size. I returned those after overcoming the reluctance of the cashier by explaining that I had been told in advance that I could return them. Apparently they don’t keep the Toklat Little Likits in stock, so they ordered them for me. I also got some surcingle t-holders since Lorie had said that the surcingles on his new sheet were coming undone. Logan texted me while I was at Horsetown to say he was 35 minutes out, so I took off to meet him. 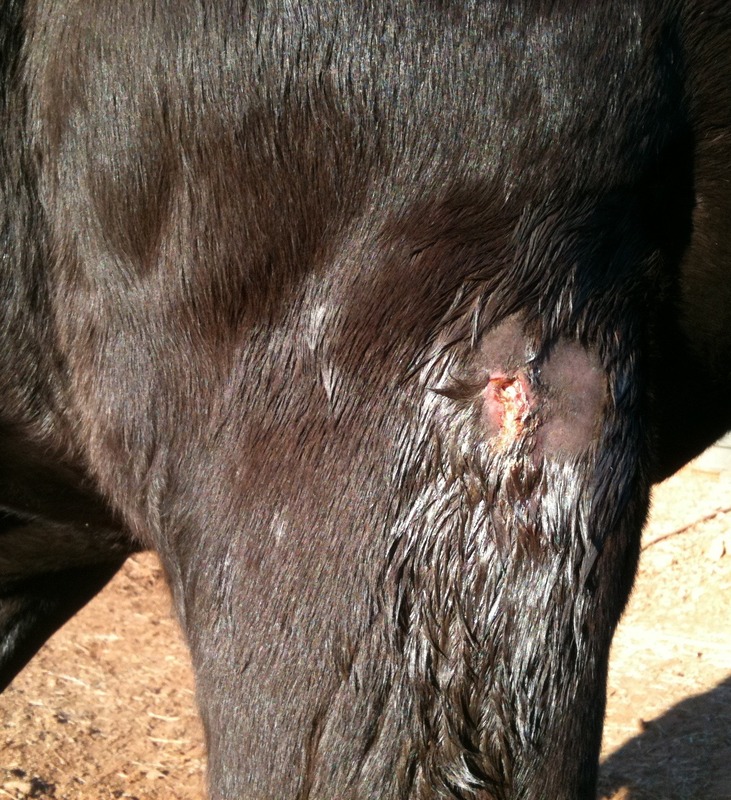 When I got there, Lorie and Logan had already been wrestling with Vindy trying to clip the area of the abrasion. His knee had swollen to the size of a grapefruit. As it turned out, the injury was a puncture wound. We had to go through the whole sedation and twitch rigamarole to allow Logan to work on the injury. Vindy is very good at pretending he is dopey and out of it, then hopping backwards down the barn aisle on three legs without the slightest sign of losing his balance. After a great deal of wrestling, Logan was able to clip the injury, clean it, inject it, put some Lidocaine in there, assess the size of the puncture, and flush it with penicillin. The good thing is that the puncture wound goes up into the forearm, so it is already draining the way it needs to. Logan prescribed a week of oral antibiotics but said Vindy doesn’t need bute since the injury isn’t causing lameness and the swelling is just caused by fluid, not inflammation. 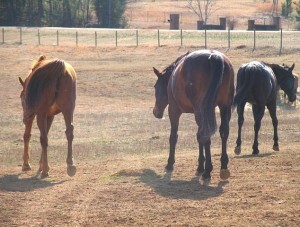 Logan left, and I turned Vindy back out in the side pasture with Phantom so he could move around some more. I texted Lorie today, and she says it is a tiny bit better, but still swollen and draining. Vindy feels fine though. We’ll keep a close eye on him over the next few days. Yep, it's gross. This is the puncture wound after Logan's treatment. You can see here how big his right knee is compared to the left. Ouch. 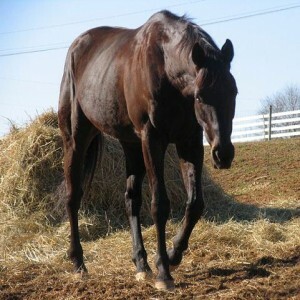 On Wednesday the 26th Lorie texted me to tell me that Vindy was lame and seemed to have some tendon swelling in the right front. 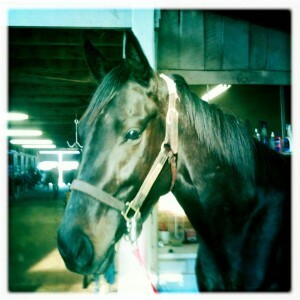 She iced it and gave him some bute, and we decided to put him on stall rest. 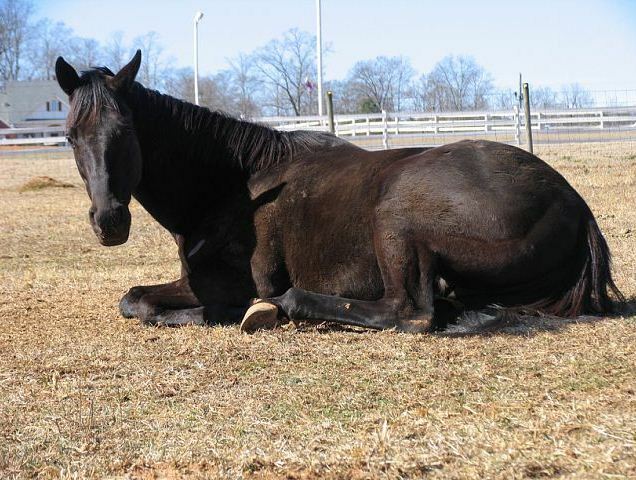 Logan was already scheduled to come out on Friday the 28th, when Vindy was supposed to have his vet check, so we decided to have him look at it then since we knew he wouldn’t prescribe much beyond stall rest anyway. I took a half day off work to be there for his exam. Fortunately, by Friday the swelling and lameness were gone. By the time I arrived at the barn, it was Vindy’s turn, so I took him out of his stall and put him in the wash rack crossties. 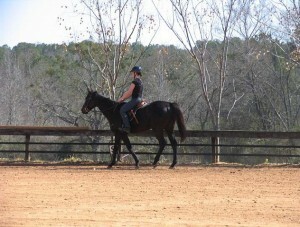 Logan started by giving him a general exam, then we took him out to the arena for some trot tests. After being on stall rest since Wednesday, he was full of vinegar, so as we trotted up and down the arena he did it with lots of neck arching and prancing. 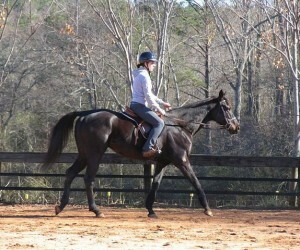 We did regular trot tests, then did the flexion tests. Next Logan wanted to see him lunge. I told him that Vindy does better free lunging, but I agreed to try the lunge line first. 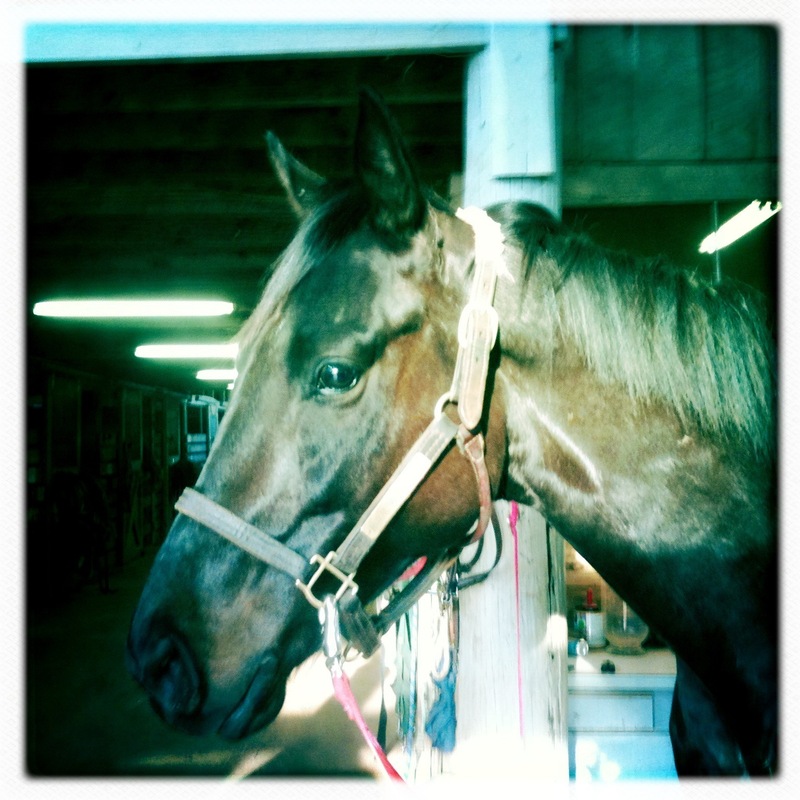 Being full of vinegar, he acted the polar opposite of his usual behavior, acting up, dragging me across the arena, bucking, and putting on a show. 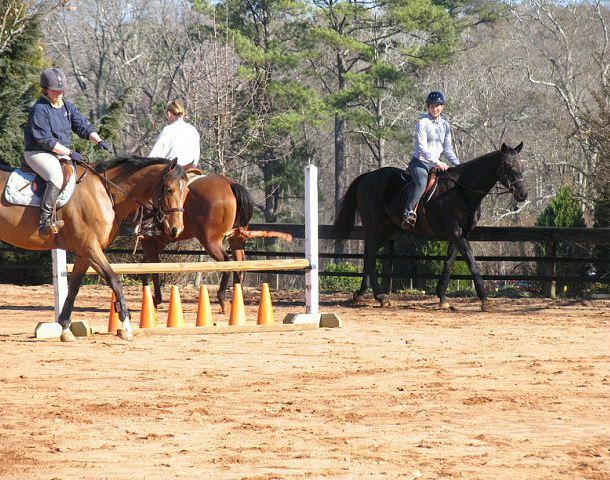 We all decided the round pen might work better. In the round pen, I had better results. 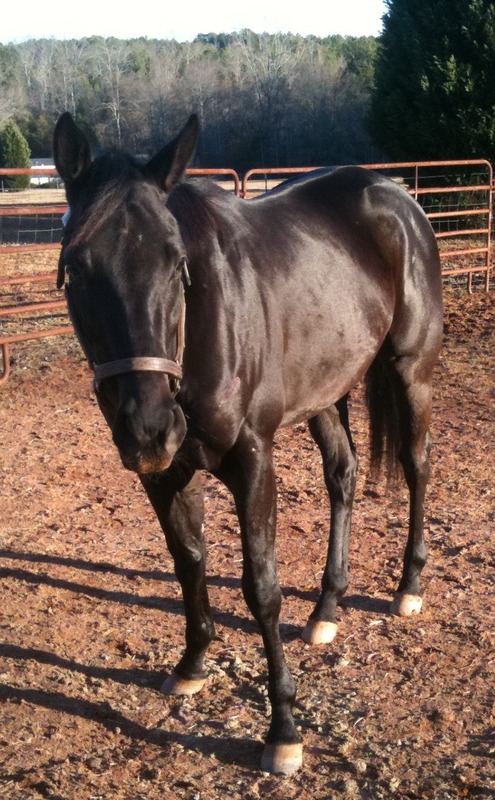 He was still full of fire, but I was able to get consistent (albeit speedy) trotting out of him. After all that, we took him inside for x-rays. Logan did films of his front feet, his knees, and his hocks. 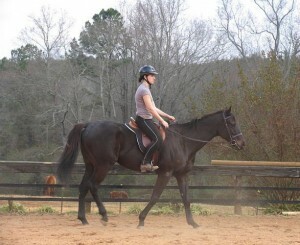 They all came out clean, and Logan said that his trot tests had shown no signs of soreness. 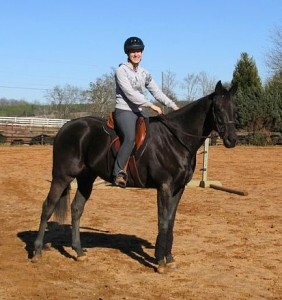 He also said that he is a very well balanced horse. The one thing we need to be aware of is his thin soles. Logan wants the farrier to work on keeping the sole and letting the toe callous grow. 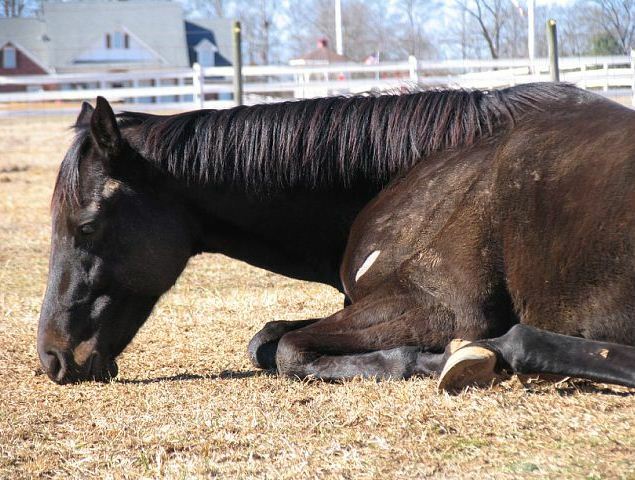 He also shows sensitivity when handled around his belly, so we need to work on that. Logan cleaned his sheath (for which Vindy was extremely uncooperative, despite sedation and the twitch) and flushed his right tear duct since his eye has been draining. He looked at the bump above his eye and said it doesn’t look like a tumor and is probably from an old bump on the head. He said it is probably solely a cosmetic issue. He then pulled his Coggins and gave him his vaccinations. He also took a look at the bump on his left rear cannon and said it shouldn’t cause any further problems. This wrapped up the work Vindy needed done, so I started to groom him. As I was doing so, I realized that his right forearm looked strange. I said to Logan, “Am I crazy, or does he have filling in his leg?” Logan came over to take a look and confirmed that he had edema in that leg. He said he had an appointment over at the pasture the next day so he could come by and look at it then. In the meantime he told me to cold hose it and to turn him out since the movement would be good for it. Logan left, and I was able to cold hose the leg for about 10 minutes before Vindy decided that (a) his sedation was wearing off and (b) he had been through quite enough for one day. He refused to stand still any longer, so Lorie and I decided that I should turn him out in the round pen. I took him out to the round pen, and he seemed fine. They started to bring the other horses in, and he still seemed fine. After a while I decided to leave, so Lorie told me to bring him on in. I went out to get him, and he was running frantically around the round pen, wheeling and changing direction, snorting and puffing. He wouldn’t come to me or respond to my commands of “Easy” or “Whoa.” I texted Lorie, and she joined me out there. She climbed the round pen and snagged his halter as he ran by. I’m just glad I had left his halter on him. I handed her the lead rope so she could snap it to his halter, then I led the crazed, whirling beast to his stall. Lorie says he has some separation anxiety, and I guess after all the horses came in, including Stuart, he freaked out at being left alone. Once he was in his stall, he was fine. Showing no signs of the fireworks about to ensue. 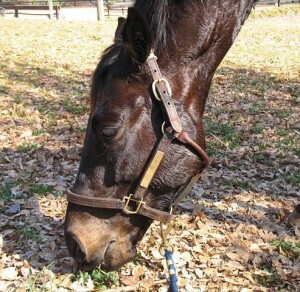 Notice the dirt moustache--a common occurrence, hence the mineral block in his feed bucket. Vindy had been eagerly awaiting the visit of his aunt Maggie, who had just been as eager to meet him. She flew down from Richmond on the night of Thursday the 20th to spend the weekend with me. We had a lot of activities (read: shopping) planned for her visit, but of course one day was set aside for Vindy. We picked Sunday since the forecast was calling for the warmest weather that day. We went to the barn and could see Vindy out in the front pasture as we pulled up. We went out to fetch him, and as usual he came to meet us when he saw us. The power of peppermints. We took him inside and groomed him and tacked him up. The round pen had dried out a good bit, so I was eager to try free lunging him. We gathered the equipment and took him out there. I let him explore the round pen a bit on his own, then started lunging him. As predicted, he did much better with the free lunging, and I was able to get consistent walking and trotting out of him. It did take some work, but I was thrilled with his progress. After lunging him a bit, I decided to ride him in the round pen as well. I rode him at the walk and worked to get some trotting out of him, but didn’t get more than a couple of steps at a time. I think we’ll have better luck doing trot work in the arena. I asked Maggie if she wanted to get on him, and she said yes, so I put the lunge line on him, gave her the helmet, and she got on. I led them around the round pen at the walk, and Vindy was a perfect gentleman. Then she got off, and I belatedly remembered that I hadn’t taken a picture, so she got back on, and I took a couple of pictures with her camera. Then she got off for the second time. We took Vindy to the barn and untacked him, then took him out to the pond to take some pictures with my camera before putting him in his stall for the evening. Since his blanket needed some repairs, we took it home with us so Maggie could mend it that evening. We also went by Horsetown so I could get additional Little Likits for Vindy’s Tongue Twister toy. They didn’t have the Toklat brand, and they told me that the Jolly brand would work. I was skeptical, so I asked if I could bring them back if they didn’t fit, and they said yes. Then we were off for more adventures. 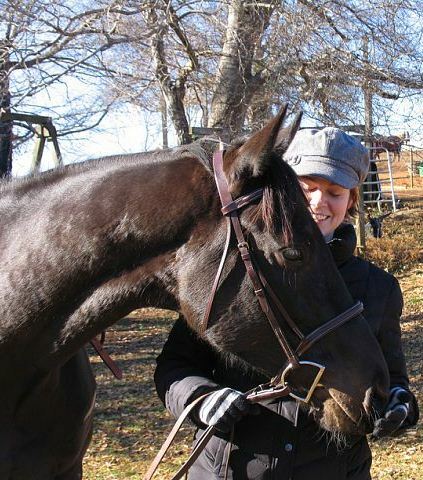 After a week of being snowed in, my good fortune in having Vindy come into my life had started to feel unreal, so I was eager to get back to the barn once the roads were safe. 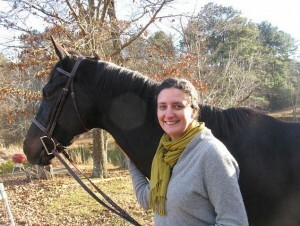 On Saturday afternoon I swung by Tinsley’s house and picked her up, and we headed out there. Vindy and the rest of the horses had weathered the snow quite well, and most of it was gone by Saturday anyway. He had torn a large hole in his blanket and he had a scabbed injury on his left hind cannon with some swelling around and below it, but he wasn’t sore on it at all. Brad had also pulled his front shoes the day before, since he had determined that Vindy should be fine without shoes as long as we are only doing light arena work. We groomed him and tacked him up, and he continued to do fine in the crossties. His only bad habit is that he still enjoys sucking in the crosstie like a piece of spaghetti and chewing on it like the mouthy youngster he is. 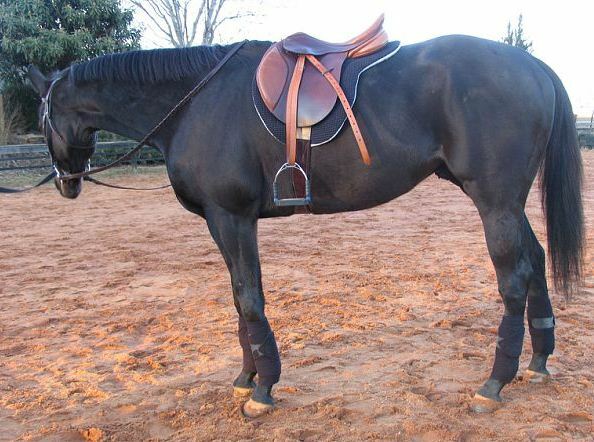 He showed signs of being cinchy for the first time when we saddled him on Saturday, so I will be making a point to go very slow with the girth tightening. 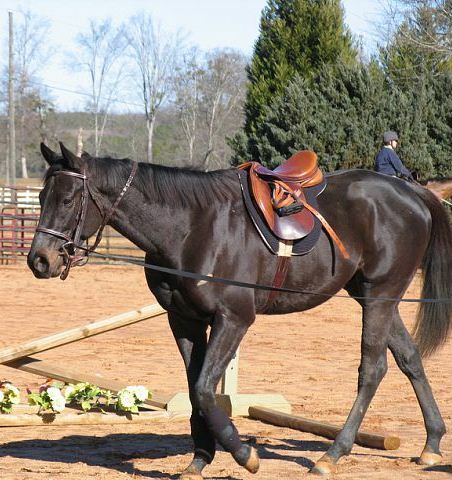 He acted cinchy in the crossties, but he didn’t do it when we tightened the girth in the arena, so it might be more about anticipation than anything else. I lunged him again but kept him on a smaller circle, which is what Beyond the Track had recommended if the horse is coming into the middle and facing you like Vindy has been doing off and on. The smaller circle garnered much better results going to the left, but we still had some challenges going to the right. I still want to try free lunging him in the round pen, but it doesn’t have the sand footing like the arena does and thus can’t take as much moisture, so it was quite slick in spots. Tinsley got on him after the lunging session; I led her around on the lunge line and then took some pictures. 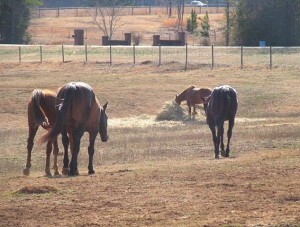 It was fairly late in the afternoon, so they were bringing the horses in for feeding. Since we weren’t sure how he would react, we decided it would be safer to get off him in the interim. After the horses were safely in the barn and it was clear he wasn’t really going to react, I got on him and Tinsley led us around on the lunge line. It went well. We took him in and used some duct tape to repair his torn blanket, then put him in his stall for his well-earned dinner. 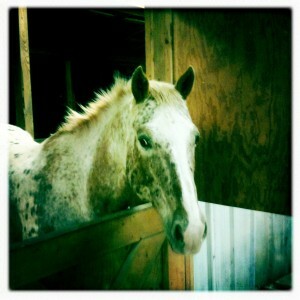 I went out to the barn again on Sunday afternoon. He still had filling in his left hind as well as a little bit of puffiness in his front ankles, so I didn’t want to push him. I tried lunging him at the walk first, but he was being very resistant to the whole process. Mary Jo and Kaye told me I should just get on him, so I did. We kept to the walk, but it went well. He was quiet, and we worked on walk/halt transitions. Some of them were quite good; others not so much. All in all, I was very happy with our progress. 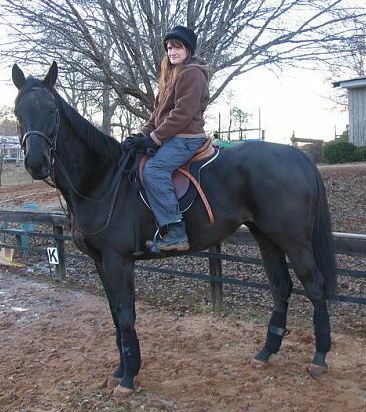 I got off and took him in the barn for untacking and put some liniment on the legs that had the filling. 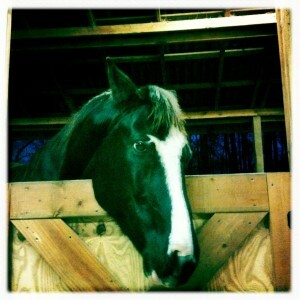 I went to the barn again on Monday. He was out in the front pasture with the other geldings, and when he saw me he came trotting up for his customary peppermint. The filling in his front legs was gone, but he still had some in his hind ankle. I was hoping the rain would hold off until the late afternoon, but it started while I was tacking him up. I held off for a while to see if it would stop, but it was showing no signs of doing so, so I decided to ride anyway. I don’t know if that was the best decision. 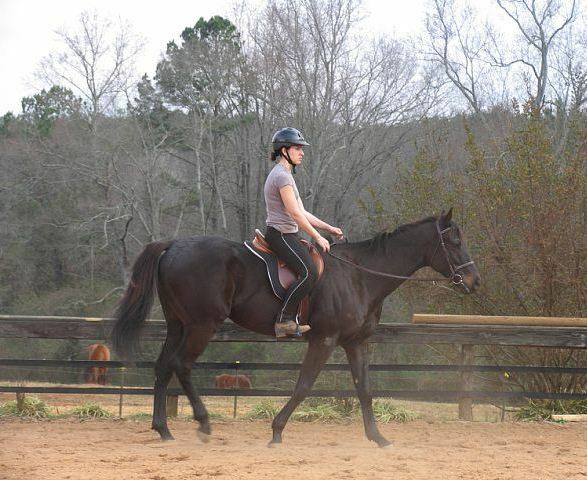 I got on, and he immediately took off trotting, which he had never done before. That was no big deal, but on the next trip around the arena, he acted almost spooky and veered away from the rail near the barn and resisted my aids all the way across the arena. He continued to act spooky and strange at certain parts of the arena, in addition to stopping to chew on the shrubs. Whether he was reacting to the sound of the rain on the tin roof and on the bushes around us, or whether he was just in an uppity mood, I’m not sure. Then Stuart started going around and around one of the shrubs rubbing his blanket against the trunk and the branches. I didn’t know what it was at first; it sounded like a monster in the bushes. Vindy wasn’t spooking at the noise, but he had definitely stopped to stare. I hopped off and peered over the railing and saw that the noise was caused by Stuart’s shenanigans. At that point, I decided to give up for the day. We weren’t accomplishing much, and neither of us was relaxed or focused. I took him in, rubbed him down, put his blanket on, and turned him back out. It had been a good weekend for the most part, and we had gotten to spend a good deal of time together.